romania — ...and we're off! the great thing about not planning too far in advance is that it leaves room for surprises. in our quest to find the best route to turkey, romania ended up being the perfect segue. we found a cheap redeye from barcelona to bucharest, and from there it was less than a hundred dollars to fly to istanbul. we were sold! we arrived in bucharest a little after 4am on tuesday and decided to rent a car and explore transylvania. it was hard to believe we were going to a region that had always seemed so mysterious and far away. alex and i tried to get what little rest we could in the airport before the rental place opened. a few sleepless hours later, we were driving along in our tiny white renault twingo towards brasov. neither of us knew what to expect, and we were both blown away by how beautiful the romanian countryside was. it was a difficult three-hour drive though – not because of the traffic or the roads (which were surprisingly nice) but because of how dead tired we were. alex ended up having to pull over so we could take a quick nap before we finished the drive. most of the hostels and hotels were located in and around the old part of town, but we thought it’d be interesting to stay a little further out and rent through airbnb. the directions to the apartment were easy to follow, but actually finding the place proved to be a bit challenging. the apartment was in a confusing complex of boxy, somewhat drab-looking concrete buildings. most were gray, a few were shades of pink and green, and each was marked by block number and building number. as we were wandering around trying to find the right one, it was clear that the people around us were surprised to see a couple of foreigners in their neighborhood. although it’s been over twenty years since the collapse of the communist regime and romania’s national treasures are definitely worth seeing, not too many people think to visit or stray far from the touristy bits. we eventually found the apartment—a cute, very spacious one-bedroom that ironically had the fastest internet of all the places we’d been to. at $35 a night, it was also the cheapest! the place belonged to a girl named laura, and from the way she wrote her airbnb description and the books on her shelves, she seemed just as american as she was romanian. then there was her father, who didn’t speak a word of english when he let us into the apartment. like the other older locals we’d encountered, his wrinkled forehead and worn expression seemed to wonder, why are you here? the contrast between “old” and “new” romania was already quite striking. after settling in, we spent the rest of the day exploring the old town. to go from the sunny shores of southern spain to the landlocked interior of romania was an interesting change of pace. our first taste of local cuisine was absolutely delicious. we ate at ceasu’ rau, a restaurant i’d read about that was just outside the old center and popular among locals. if you ever make it here, make sure you sit out on the terrace so you can watch the grill master cook everything to perfection. our eyes grew wide when our waiter brought out a generous platter of ribs, chicken schnitzel, and polenta with cottage cheese and fresh cream. with our bellies full and happy we rolled into town, which was built against a backdrop of gorgeous green mountains. the colorful buildings and architecture made for a very picturesque view. 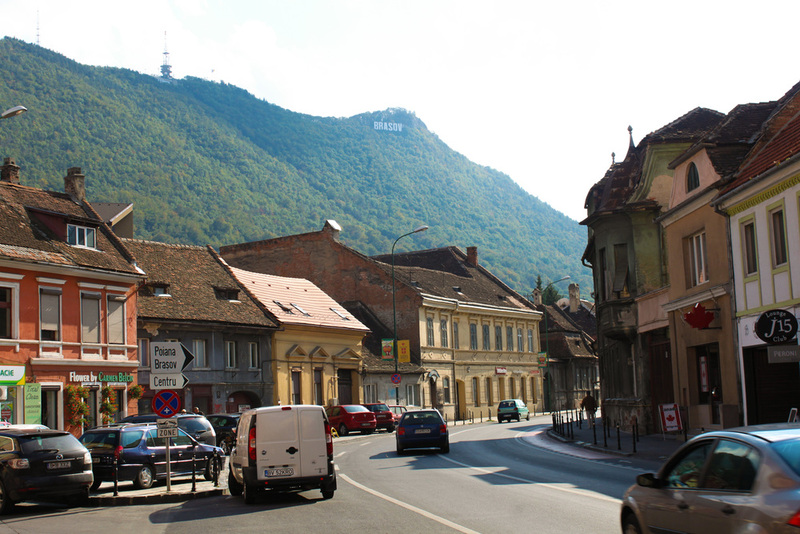 brasov even has its own hollywood-esque sign! we paid a visit to the black church – the largest gothic church between vienna and istanbul – and were lucky enough to catch an organ concert there, which was hauntingly beautiful. the next day we began our tour of the transylvanian region. we drove to bran to check out dracula’s castle, which actually has nothing to do with dracula. legend has it that this was the spot where vlad the impaler (bram stoker’s muse for dracula) was betrayed, but there are differing accounts on whether or not this is accurate. that aside, the castle itself is impressive in all its 14th century glory. after getting stuck in a sheep traffic jam (!! 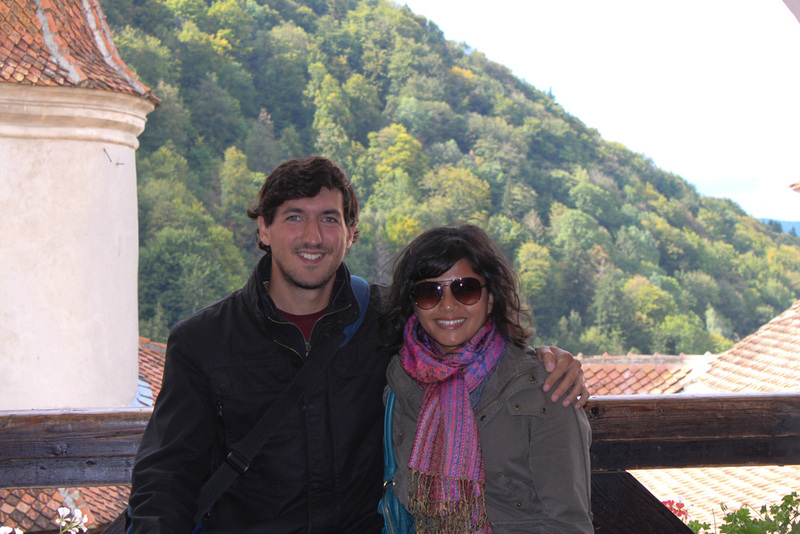 ), we drove to sighisoara, another beautiful town which is where vlad the impaler was born. on our way back – and throughout our road trip – we encountered many ridiculously aggressive drivers. this was especially unnerving since it was dark out, which didn’t seem to stop these daring romanians from risking their lives passing 2-3 cars at a time before barely avoiding a slew of oncoming traffic. sheep traffic jams are way more fun than regular ones. thankfully we lived to see another day, which we spent exploring sibiu. at first the city seemed to be completely dead, but as we continued to walk further into the town center, we heard singing and stumbled upon large throngs of people waiting to get into some sort of outdoor show. it turned out that sibiu was hosting the media music awards, which meant we got to hear a bunch of romanian pop, rap, and rock stars perform live! the city also happened to be hosting drivers competing in the rally touristique des alpes – a race which basically involves super wealthy car enthusiasts driving their super amazing classic jaguars and mercedes across the mountains. alex was drooling over a silver 1950s gullwing mercedes easily worth at least $500,000. our night in sibiu ended with alex enjoying the best goulash he’d ever had, and me scoring a pair of sparkly high-top sneakers. the best part was that our meals and purchases all cost what you’d expect to pay back home, except in romanian lei so you get to divide the price by three. definitely my kind of math. the next day was our last in romania, and it turned out to be the most memorable. after seeing pictures of the ridiculously squiggly transfagarasan highway, we decided we couldn’t leave the country without driving it. the road was built in the early 1970s so the military could have quick access across the carpathian mountains if the soviets ever tried to invade the country. the road is 90km of hairpin twists and turns through the two tallest peaks in romania, so it isn’t hard to believe that forty people died building it. this only built up my excitement and alex’s trepidation for the drive. we encountered another traffic jam - this time cows - as we drove towards the mountains. within minutes of turning onto the road, we saw the word “hell” painted on the pavement with an arrow pointing in the direction we were headed. awesome. four unforgettable hours later, we were so grateful we kept going. 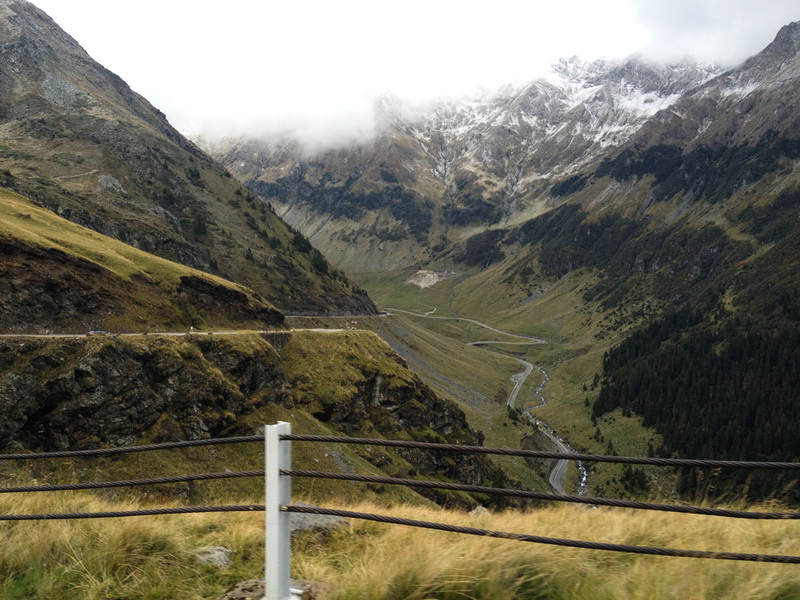 the transfagarasan highway was the most awe-inspiring, breathtaking, and dangerous drive we’d ever done. we climbed to an altitude of 2,034 meters, creeped along the edge of sheer drops with no guardrails overlooking stunning views of the valley, drove through thick fog with hardly any visibility, and came out the other end of a long, snowy tunnel realizing we’d just gone through the tip of a gigantic mountain. once we got further down the other side, we ended up getting stuck behind a logging truck and an audi r8. there were also two classic jaguars and a minivan behind us, which made for a very funny rag-tag parade of cars on this tiny, two-lane road. we had become part of the rally touristique des alpes by happy accident! after our heart-stopping drive through the mountains, we made it to the main highway and drove back to bucharest to catch our flight to istanbul. it was a whirlwind tour of an incredibly beautiful region, and we will never forget our adventures in romania.